Learn the story of the Park's history, design, and ecology, and get an insider's look at the world's greatest urban park. Plus, Official Central Park Tours are the only tours that help support the care of Central Park! Groups of seven or more must schedule a Group Tour. Receive discounts on ticketed tours and access to members-only tours by becoming a member of the Conservancy. Have questions or need more information? View our FAQ. SORRY, THIS TOUR IS CANCELLED. SORRY, THIS TOUR IS SOLD OUT. 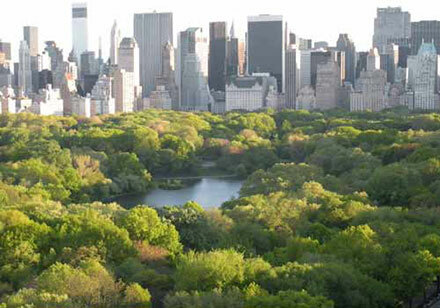 Central Park Conservancy offers one-of-a-kind, walking tours of the world's greatest urban park. Whether you're visiting Central Park with a group or looking for a private experience, see the City's backyard with the people who know it best – the ones who take care of it! Gift certificates available. Group tours are 90 minutes and can be booked for 10:30 am or 1:30 pm, Wednesdays through Fridays, based on availability. Please submit a Booking Request to schedule a custom tour. A Central Park Conservancy staff member will contact you within three business days to customize and schedule your tour. Full payment is required at the time of booking confirmation. We accept American Express, MasterCard, and Visa. Tours take place rain or shine, however, they may be cancelled in the case of extreme weather conditions. In the event of an extreme weather cancellation, the tour may be rescheduled or refunded. Payments are non-refundable if customer cancels after the tour has been confirmed. Our most popular option, these walking tours cover a variety of topics and Park sites. Learn the inside scoop on the Park's history and design, landscape architecture, most popular sites, and many other features that make Central Park so unique. Choose from the Iconic Views of Central Park, Heart of the Park, The Ramble, North Woods, or Seneca Village. Tour the Park's only formal garden, known for its extraordinary floral displays, through the eyes of its curator and director Diane Schaub, and her experienced staff. With over twenty years of experience managing and designing for the Garden, Diane offers a singular perspective on its history and design, as well as some of the special plantings found in this six-acre urban gem. Hundreds of annual and perennial varieties, eighty-year old crabapple allées, and exceptional fountain sculptures are among the Garden's treasures. 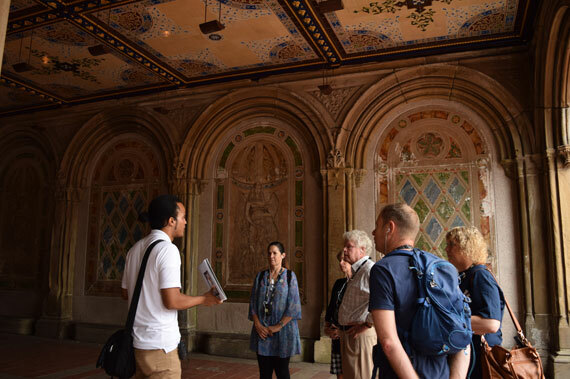 See Central Park on your own schedule with these self-guided tours highlighting the Park's history, design, ecology, and horticulture. If you are unable to join one of our scheduled tours, you might be interested in one of our downloadable, self-guided tours described below. Each tour will take you to the most visited and the most popular sites in Central Park. Select your language below to download PDF guides for each tour. Each month discover something new in the Park with a mile-long walk. Features the Conservatory Garden, Harlem Meer, Fort Clinton, and the Charles A. Dana Discovery Center. Did you know that there really are turtles in Turtle Pond? Or that Belvedere Castle has been a weather center since 1919? Features the Dairy, Chess and Checkers House, Wollman Rink, the Pond and Hallett Nature Sanctuary. Get a taste of the Adirondacks without leaving New York City. Wander at your own pace along six scenic routes that highlight scores of trees, each marked with identification plaques on the trunk or on a nearby sign in the ground. On your next walk through Central Park, access our Audio Guide featuring commentary by New York's most famous celebrities. Visit Central Park, wherever you are, with this guided, virtual walk that starts at West 72nd Street, and takes you through the heart of the Park. Compatible with desktops, tablets, and smartphones; no download needed. For best experience, use Firefox or Google Chrome.